Time is money and every unrecorded minute is lost revenue. For some businesses, more than 30% of billable time is lost due to poor timekeeping. Now its easy to accurately and quickly track time with Bill4Time. No more spreadsheets, sticky notes and pads of paper to track time. Easily capture your time in real time. Start a timer on your phone, tablet or desktop. Enter time anytime – in your office or on your mobile device. With Bill4Time, you can capture every minute and bill what you're worth. 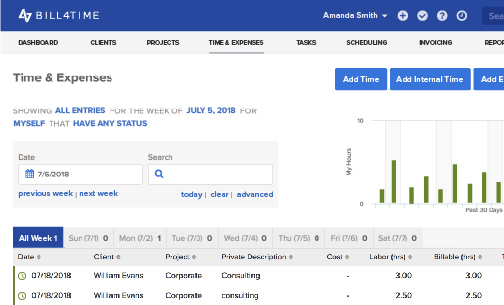 Record billable and non-billable time, separately track internal non client time, and track staff, contractors and consultants for precision and accuracy. 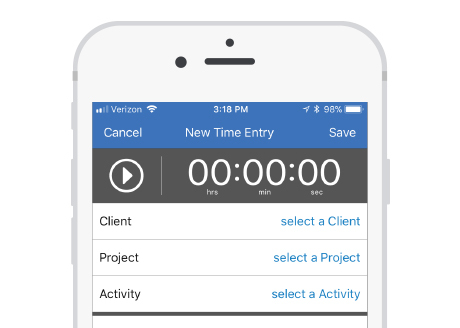 Whether youre on the go or at the office, time entry has never been so simple–simultaneously run timers, record multiple time entries in one screen and automatically convert appointments into time entries. Review and track daily and weekly time summaries so you always know the productivity and financial status of your organization. Increase efficiencies by customizing activity types and work code lists.